One of the biggest Southern Gospel Music festivals is getting ready to begin at Silver Dollar City once again! For 12 days, Southern Gospel music fans from all over come to enjoy some of the best groups in Southern Gospel! This year’s event will take place August 23-September 3 and will feature over 60 different Southern Gospel groups. From park opening until the main concert featured each night in Echo Hollow, guests will get to see these awesome groups perform throughout the numerous venues inside the park. A few of these groups featured will be: The Perry’s, Brian Free & Assurance, The Erwins, Joseph Habedank, Karen Peck & New River, Tribute Quartet, and many more. The music doesn’t stop at park closing! 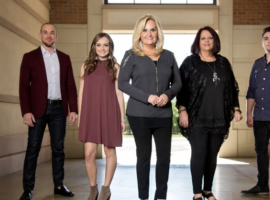 Each night there will be a special “Southern Gospel Nights” performance at Echo Hollow. Thousands of people come together to be a part of the evening concert each night. A few of the groups that will be showcased during this time include: The Isaacs, Triumphant Quartet, Ernie Haase & Signature Sound, Legacy 5, The Collingsworth Family, and several others. On top of the many concerts at Silver Dollar City, the Showboat Branson Belle will also be hosting Gospel cruises from August 26 through September 2. Each Gospel cruise will depart at 12pm and will feature a delicious meal along with an incredible performance from an amazing Gospel group. A few of the Gospel groups that will be featured include: The Freemans, Dixie Echos, Gold City, and Jason Crabb. This is a Southern Gospel music fan’s dream! So many great groups performing in one place! It’s definitely going to be an outstanding event!